To gain a better understanding of the precise anatomy of the lateral ligaments of the ankle through a systematic review of published cadaveric studies in order to improve anatomical minimally invasive surgery (MIS) for treatment of chronic ankle instability (CAI). A systematic review of the literature was performed using the PubMed, EMBASE, Cochrane databases and Web of Science on June 2015 with the two search concepts: “lateral ligament of the ankle” and “anatomy”. Anatomical studies that reported gross anatomy of the anterior talar fibular ligament (ATFL) and calcaneal fibular ligament (CFL) in English were included to assess the morphology and origins and insertions of the ligaments. All records found in the literature search were screened by title and abstract. Potentially relevant articles were selected for full-text review. Each of the identified articles was reviewed and included in qualitative synthesis. 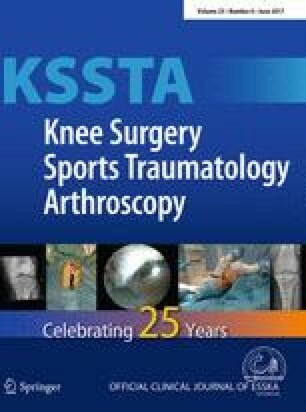 The following data were abstracted from the included articles: authors, date of publication, sample size, mean age, the length and the width of the each ligament, number of bundle of the ATFL and the location and the footprint of the origins and insertions for the ATFL and CFL. Sixteen studies were identified indicating the length of the ATFL and CFL was 12–24.8 and 18.5–35.8 mm, respectively, while the width was 5–11.1 and 4.6–7.6 mm, respectively. Fibular origins of the ATFL and CFL were located on the anterior border of distal fibula at a distance of 10–13.8 and 5.3–8.5 mm proximal to the tip of the fibula, respectively. The talar insertion of the ATFL was located 14.2–18.1 mm to the subtalar joint or 11.3–14.8 mm to the anterolateral corner of the talar body. The calcaneal insertion of the CFL was located 12.1–13 mm to the subtalar joint or 13.2–27.1 mm to the peroneal tubercle on the lateral wall of calcaneus. Systematic review of the literature of the research for the ATFL and CFL has identified the morphology of the ligaments and their location of origins and insertions. This is the best available data about the ATFL and CFL which will facilitate more precise anatomical MIS for treatment of CAI. The Biomet sports medicine department provided the use of the cadaver laboratory and pictures. No benefits in any form have been received or will be received from a commercial party related directly or indirectly to the subject of this review. No sources of funding were received to assist in this review. The authors have no conflicts of interest that are directly relevant to this review. K.M. has made substantial contributions to conception and design, or acquisition of data, or analysis and interpretation of data and has been involved in drafting the manuscript or revising it critically for important intellectual content. M.T., Y.T. and S.O. agree to be accountable for all aspects of the work in ensuring that questions related to the accuracy or integrity of any part of the work are appropriately investigated and resolved. M.G. has given final approval of the version to be published. All authors read and approved the final manuscript.